The borough may not have a chamber of commerce, but that does not mean local businesses suffer from lack of promotion. Now an innovative new project is featuring top cafés through art, linking two of the borough’s most famous attractions. 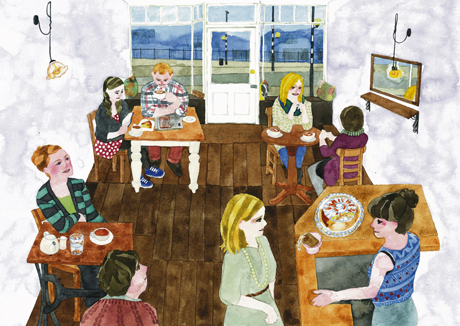 Katya Katkova has started the project, known as East London Mornings, with the aim of collecting paintings and drawings of local cafés. The ultimate goal of the project is to publish an art guide to the best Hackney morning spots. Katkova has already attracted a number of well-known artists and illustrators to the project, including Jonathan Chadwick, Veronica Wood, Besheer Abbaro, Emily Wallis and Neri Ishida. Each artist has contributed by rendering one of their favourite local eateries in a style suited to the place. The result is a smorgasbord of colour and atmosphere. The pictures also give you a pretty good idea of what the various cafés look like in real life, lending them practical as well as artistic value. Through this project café owners and local residents will also have the opportunity to share thoughts and ideas about what the borough means to them. An area known for its lively cultural scene and its vibrant café culture cannot escape the notice of discerning customers, and this new project will link together some of the borough’s best-loved venues through the most appropriate medium – art.